The title is a little misleading. Things are definitely moving along, but not without a few more CUT! Reshoot!s than expected. (I promise to work on my film puns for next week.) On the plus side, if you’ve been following along in my IG stories, I think we’ve finally got it to stop raining in the house. Follow me on IG if you want to join in on some movie posters polling questions this Friday too! Let’s start with the water issues. 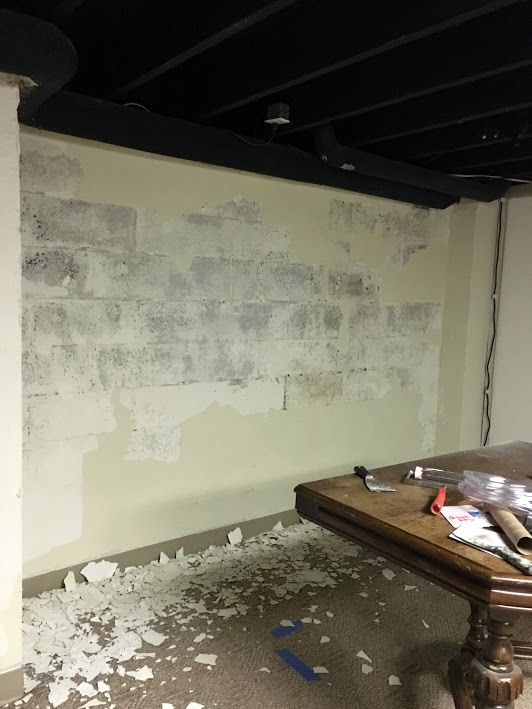 Last week we scrapped off the loose stuff covering the cinder block walls. 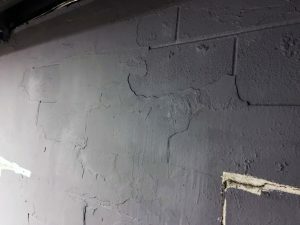 We applied waterproofing masonry paint. We filled in the horizontal gaps we could see with cement we had lying around the house. Then it rained again. Inside and out. 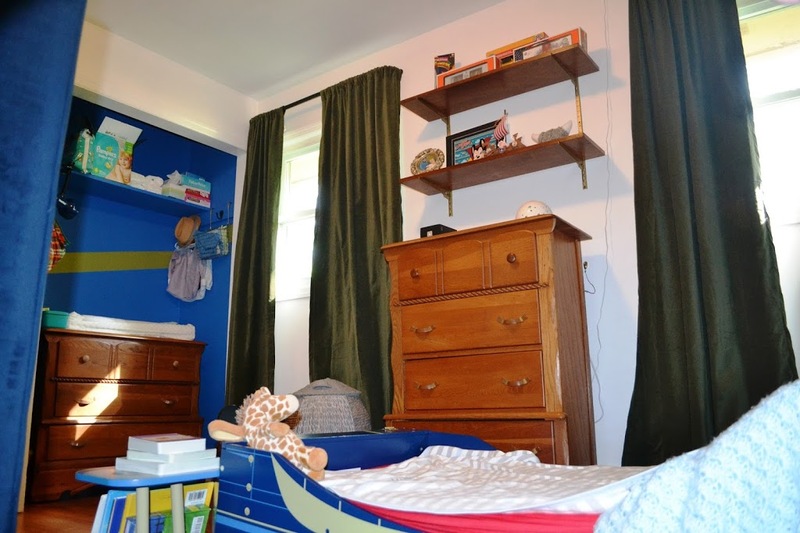 On the plus side, because of the dark color of the paint, it was really easy to see where the walls were weeping. We scrapped again, consulted the internet, and ran out to get waterproof cement (the darker gray patches in the photo below). 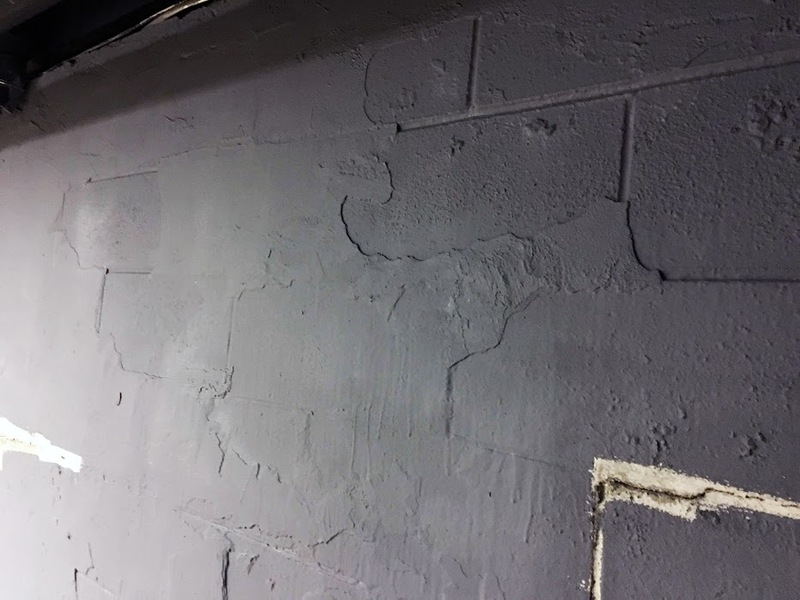 I asked Tom if he thought we messed up by using the regular cement (lighter gray patches) in the first place, but we did have decent sized gaps and he felt it was correct to fill those holes with that first. While we were waiting for all of this to dry, it was time to inspect where all of this water was coming from. It was clearly concentrated on this one area of the wall. A little backstory on the house: we purchased this house this past summer from an elderly couple who had bought it in the mid-80s and did some tremendous additions to a much smaller house before moving in. This house has some amazing quirkiness to it (I can’t wait to share it all with you!) but as they got older they spent more and more time at their vacation homes and less time here, and had been trying to sell the house for several years. They definitely let it go into a bit a disrepair, which is understandable on many levels. Our inspection brought up rotting siding issues, and among other things, most of the problems were probably due to ice damns forming on the roof line. 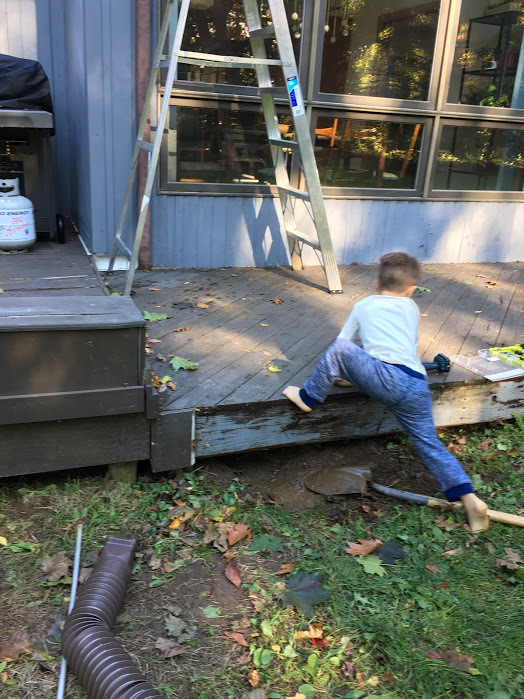 So we hired a handyman and a gutter company to remove the dry rotted wood, add in additional layers of protection beneath the new siding, and to add in gutters where there weren’t any and to CLEAN OUT THE GUTTERS THAT WERE THERE. Folks, so many problems can be avoided by cleaning out your gutters (or getting the covers that eliminate the need to clean). So we noticed this when we looked outside. See the gutters running down on either side of the windows? This is essentially our eat-in kitchen area and directly above the area of the basement that was getting wet. Well, a quick peek under the deck showed us that the gutters stopped about a foot away from the house. 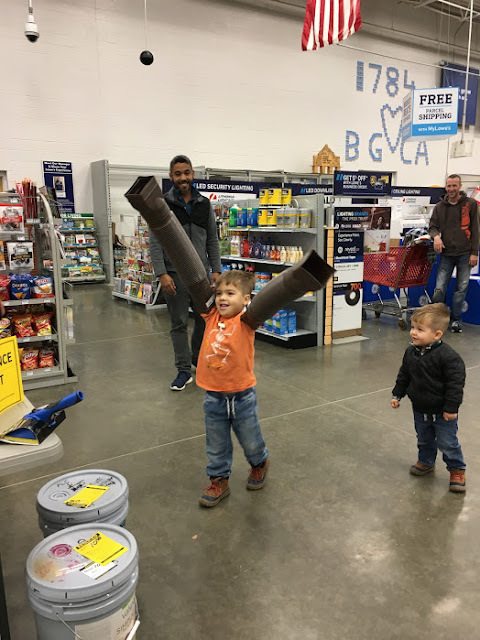 Another quick trip to Lowes for some downspout extenders (not sponsored(yet! Hi Lowes 😉)), some muddy bellies from crawling under the deck and I *think* we have really fixed the water issue. We haven’t had a really heavy rainfall since, so time will tell. I’ve even painted a second coat over all of our cement and fingers crossed, we are basically done painting. Not pictured, Theodore taking a turn with downspout arms running up to strangers and yelling “DESTROY, DESTROY”. In other news – half of our sectional arrived! After too many attempts to purchase used leather couches on craigslist/letgo/FB marketplace, we found this couch online. Tom researches the hell out of purchases and felt it was a great deal, and the same price we were seeing used sectionals listed at. Unfortunately, part of the couch arrived damaged to the shipping company so we have to wait for the loveseat to arrive, hopefully before this challenge ends. It’s not exactly what I would put in my living room, but I’m happy to report it is super comfortable and it’s exactly what we were hoping for this space. 1) We’ve narrowed down a few movie poster pics we want to purchase to hang on the walls. All of the movies have some sort of connection to us, some stronger than others, but they go in two different directions aesthetically speaking. I’ll be posting the options on IG on Friday – please help us vote!! 2) We are trying to salvage and make use of an old dining room table as a counter down here. 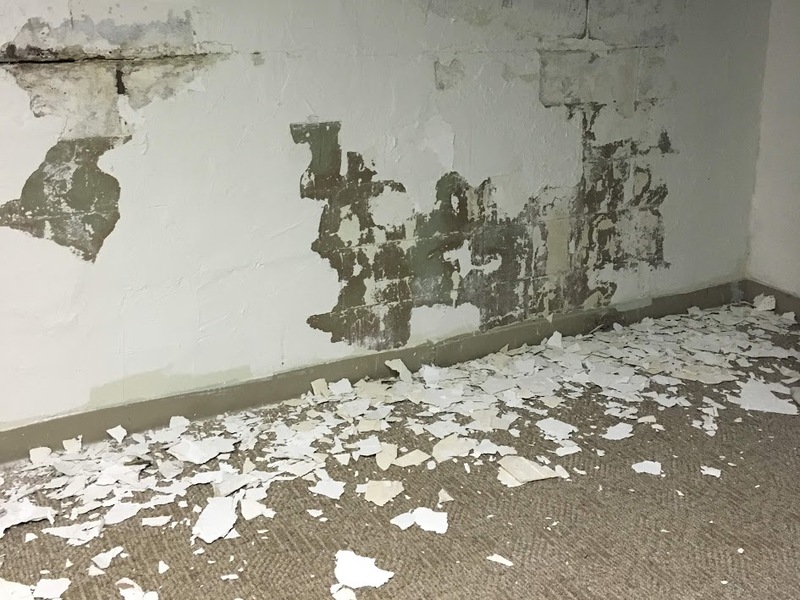 Problem is, it has seen better days, and we are taking an unconventional route and taking it apart and pushing the halved sides against the wall. My mother bought this set in the 90’s at an auction for $300. It was her set until 2007 when I moved to Brooklyn and I took over the table itself, the chairs, and the large buffet (the small buffet still lives at her house). Refinishing it is the obvious answer (there is years of water damage to the veneer on top), but I’m scared to tackle that. Painting it could be an option too, but I think the prep work will be as much as refinishing it, and more permanent, so again, scared. I kind of want to go the easy route and get a black table cloth and gathered skirt, that kinda screams movie theater to me, but is that lame? Also, those legs are kinda cool, do I want to cover them up? All suggestions are welcome, especially links to any tutorials. PHEW. Points to anyone still here. Now go check out Week 3 for the Featured Participants and Guest Participants! See you next week. Alternate title: What to do when you’ve got that exposed brick loft look but fear for the stability of your home. So please recall this makeover really started with this fun little burst pipe in the exposed ceiling of the basement a few days ago, which we burst ourselves trying to plunge and applying too much pressure to a slow kitchen drain and drano was not doing the trick, that made a general mess of this corner of our basement. We *thought* we had a couch coming this past weekend (we’ve been scouring craigslist for months) and finally found another couch online that has good reviews and the price was comparable to what we were seeing in our area for used couches. 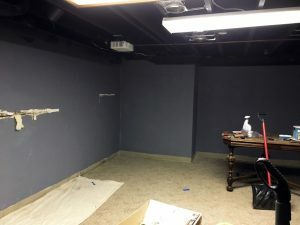 More on the couch later, but during one fitful night of sleep this past week, I decided I wanted to paint two of the walls dark, preferably before the couch arrived. So I ran out to Lowes and grabbed a bucket of waterproofing masonry paint that was tintable. I picked a medium – dark blueish gray (Edit: Sweeping Rock Storm Cloud from Sherwin Williams) in record time. Normally I would hem and haw and grab test colors and sit on it for weeks but like I said, it was Friday night and we thought we had a couch coming on Monday. Picking up waterproofing paint was merely precautionary and just seemed like the smart thing to do. 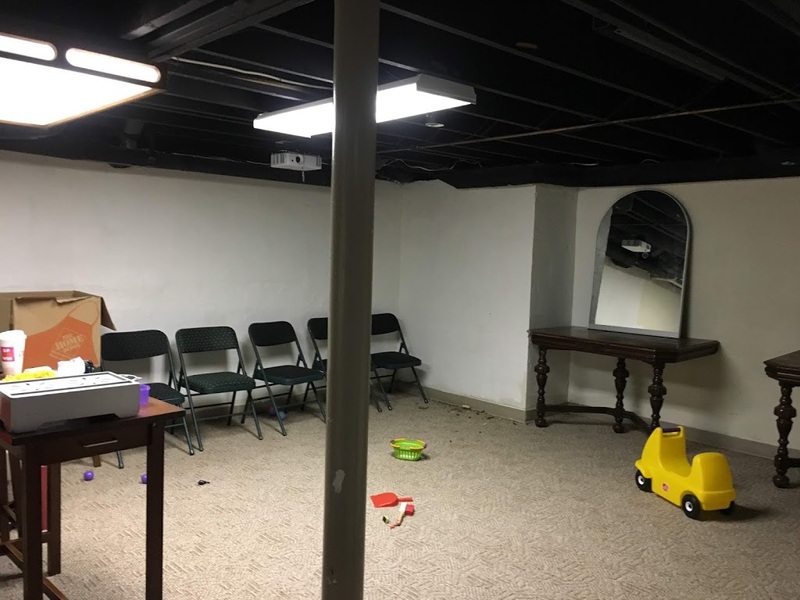 We definitely have a damp basement but luckily between two sump pumps and with dehumidifiers running, its very comfortable. But it is clear the previous owners have repainted random areas of the walls. Probably to hide issues! While my paint was getting tinted I started reading the back of the can and quickly realized this was more like an epoxy application that in order to do it right, involves scraping all of the old paint off and applying muriatic acid so as to not void the warranty. Guys, this was not happening on a Friday night. We recently expoxy-ed our garage and that was a 4 day ordeal. So we did the next best thing and agreed to scrap off anything that was loose, but skip the acid wash. WHICH TURNED INTO THIS. Scraping honestly wasn’t awful (we did run and get masks early on into scraping). Attempting to vacuum it up (clearly we did not anticipate this and had not put down drop clothes) will probably kill us 20 years from now. 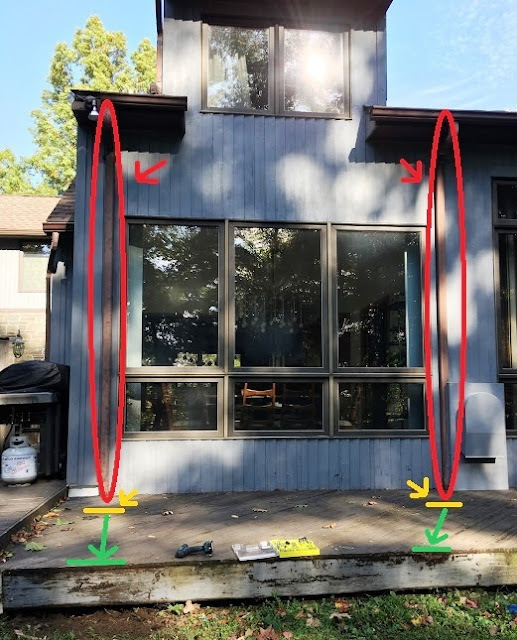 We did find some horizontal gaps, which, per the internet, if they are bigger than the size of a dime, should be concerning, for, you know, stability of the house and water seepage. Ours were not that bad, and luckily there is no bowing out of the walls but we did add mortar on Saturday to fill in the gaps. The walls are certainly texturized at this point, but I’m pretty sure that’s a thing now so I’m embracing it? Guys, I really just didn’t care at this point. I am ready to put this room back together. Generally clean up would come next, but our handy man really likes to find other jobs to do for us, so Monday he offered to install our new recessed lighting after fixing the broken pvc pipe and to take down the old random florescent lighting. Switching out lighting is one thing, running new wires is another, so Tom was happy to hand over this job to him as well. He is not one to clean up after himself (his price and general handywork is right so we accept these inadequacies) so now I’ve got wood chips all over the floor from where the new wiring had to go. But on the plus side – I LOVE THIS COLOR. 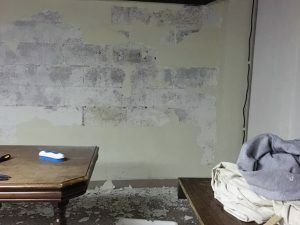 So now we’ve got paint on the scrapped walls. I need to paint the other walls white, which are all in much better condition, and I need to pick a trim color (I’m thinking just shades darker than the dark walls). We’ve got to clean up the rug and wipe down everything we didn’t take out of the room. 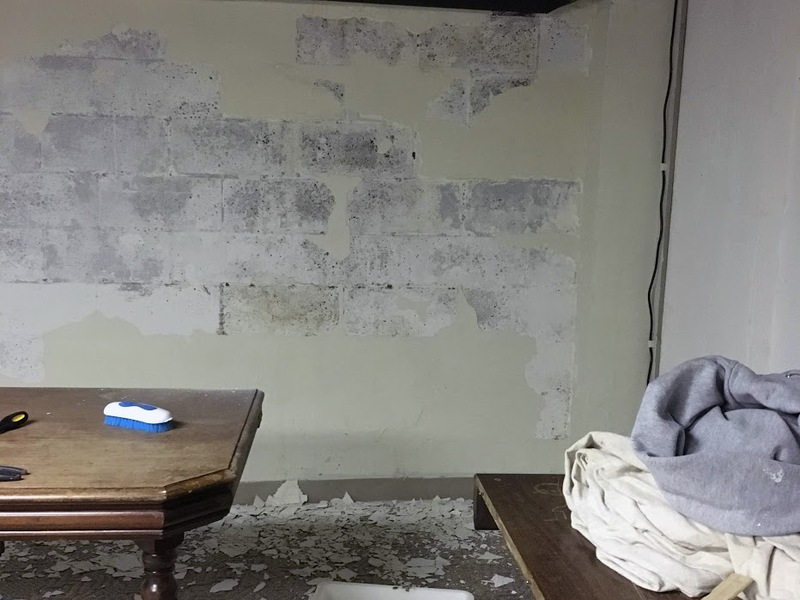 We will start moving stuff back into place and I’ve got to brainstorm an idea for the halved table that has seen better days that we are using as counter along the side wall. Suggestions welcome! Now go check out the Featured Participants and fellow Guest Participants! See you next week! So we’ve been living in our new home in Upstate NY for about two months now. This house is admittedly, crazy big. We really didn’t need this big of a house, but dammit did the aesthetic and location and yard and price call to us. 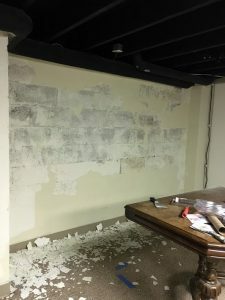 It has turned out to be a BIT more of a fixer upper than originally anticipated, but that’s ok. Every time a new problem pops up, we find ourselves groaning for a minute, and then enjoying digging in and trying to fix the problem ourselves. We’ve gotten braver over the years and have had pretty good luck so far. Cue the angels singing harmoniously. I’m living my dream, man. 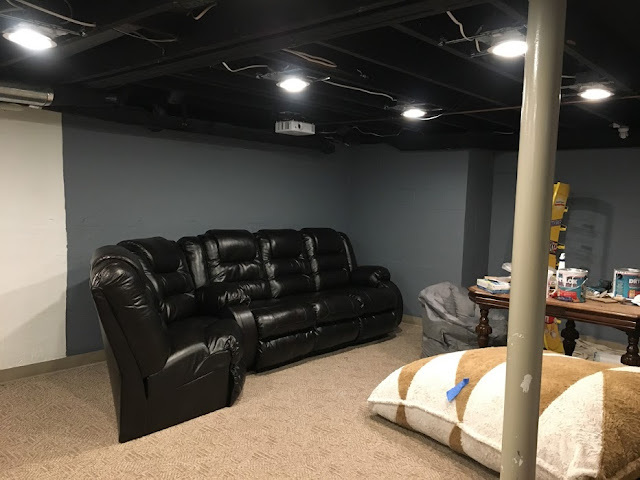 So clearly an attempt to troubleshoot a slow drain in a kitchen sink last week would snowball into creating a budget basement home theater right? I’m sorry, do you not see the obvious thought process on this one? Let me explain. As previously mentioned, this house is quite a bit bigger than our last house. This is not often a complaint you hear from home owners. And I’m not complaining, but I do want to find ways to creatively use these spaces. 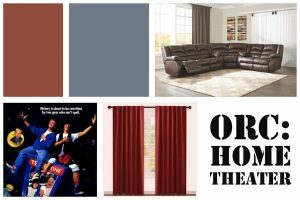 Once you’ve ticked off the obvious bedroom, tv room, play room, etc. 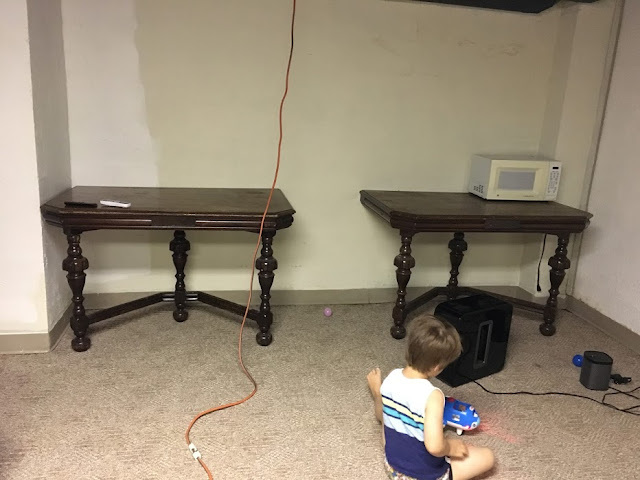 areas that a family with two young kids wants, you start to get creative with the rest. Enter the Budget Home Movie Theater on the side of our semi-finished basement. 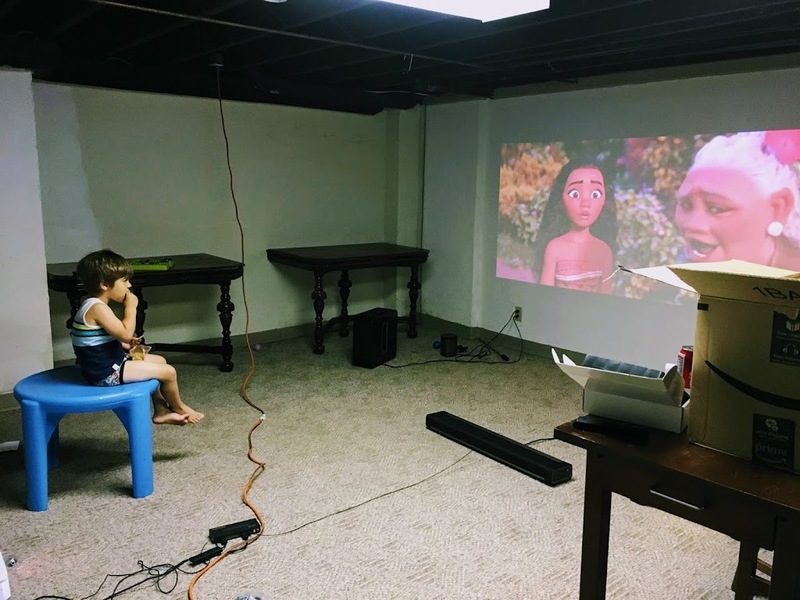 We technically bought a screen and projector and used our old SONOS system a month ago and set it up some pillows and folding chairs and that was it. But after an attempt to unclog and plunge a slow drain in our kitchen, which in turn caused us to burst a pipe in our basement in front of the screen, which caused a disgusting amount of stinky water to spill onto the carpet, and splatter on the poorly painted walls I thought to myself, hey, didn’t the One Room Challenge start this week? Maybe this is my chance to get back into blogging after a 2 year hiatus and albeit sporadic posting schedule previous to that. Still with me? 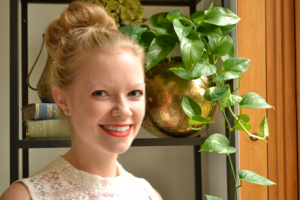 So let’s talk about the plan and why we are calling this a budget makeover. It’s less about the ability to spend and more about the practicality of spending too much on this space. Reason #1 – I have serious PTSD regarding water in houses (stories I’ll eventually blog about). 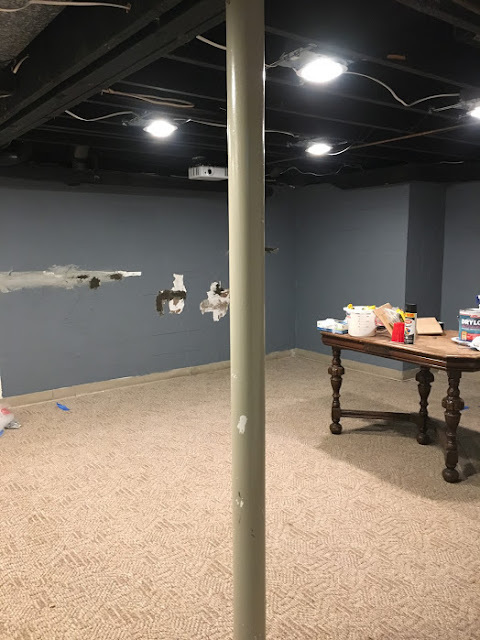 Even though this basement is already semi-finished (distinct rooms from additions built in the 80s, wall to wall carpeting in certain areas) I will NEVER trust putting up any new drywall in a basement. I’ve been burned too many times. I don’t even get upset anymore when I see water coming in through a ceiling or wall. However, accepting home ownership woes and being a masochist are two different things. What I’m trying to say is we’ve decided to visually split the usage of this room with paint and furniture, versus adding a wall to make it distinct and separate from the typical rec-room area stuff. Reason #2 – My kids destroy everything. This is of course a slight exaggeration, but I do not have it in me to spend thousands of dollars on a nice leather sectional while they are 2 and 4. We started a having family movie night a few months back (in NJ) and they are allowed to eat popcorn on the couch on Friday nights. Greasy, buttery popcorn. It’s October, so I can’t help but hand them little Halloween treat bags of M&Ms too. Contrary to popular belief, I’m not a complete ice queen. So we are searching for second hand or cheaper (and probably not exactly pretty) new couches for this area. The ceiling is too low to do traditional movie theater stadium seating, though we did consider building a platform and nixed it. A sectional with a few reclining seats or a sleeper sofa (sleepovers in a few years!) is the goal. Reason #3 – It just doesn’t seem necessary to go full fledged makeover. Is anyone else exhausted in reading about online/seeing IG photos of/watching TV shows about gut renovation jobs? I love me a good before and after, and yeah, we did that in our last house. A lot. This house doesn’t NEED any of that right now. And I’m happy to call myself a slow decorator (much to Tom’s dismay). So now that we are doing this ORC, we will probably pull together a few more things than what I would have normally done, but I can also appreciate calling a spot in our house complete. Clean, paint, buy seating, update the lighting, hang curtains, think of a plan for our halved table (more on that later), create a snack area, agree on movie posters to hang because why not. Maybe pretty up the rec room side of basement too, I don’t know, I don’t know if we’ll have time. And of course, thank you to Linda and the team at One Room Challenge for continuing to host such a fun group experiment. As always, the Featured Designers will link up on Wednesdays, and Guest Participants will link up on Thursday through November 8th!